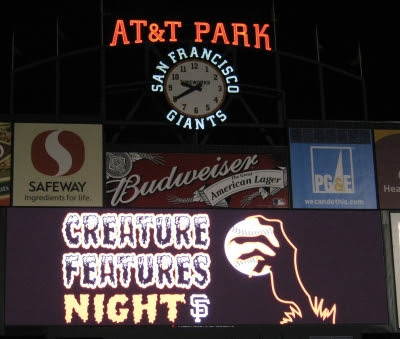 Scary times up in AT&T Park. Mets @ Giants, 12:45p PT. Zack Wheeler (2-1, 4.29) faces Matt Cain (5-5, 4.85), with a chance for the Mets to sweep the Giants. In each game of this series, it's gotten easier for New York. Game 1 on Monday was a 16-inning, five-and-a-half-hour dirge of six scoreless frames before the Mets got Eric Young to single, steal second, get sacrificed to third, and come home on a two-out fielding error by Brandon Crawford. Mets win, 4-3. Game 2 on Tuesday was a back-and-forth seesaw battle tied at 5 until the 8th inning, when Giants reliever Jake Dunning came in trying to stave off a one-run deficit with the bases loaded, when Marlon Byrd uncorked the first pitch for a grand slam (putting the Mets up 10-5; they won 10-6). Today's the third and final game of the series. Giants have dropped 15 of their last 18 games. Eric Young scores on a Dan Murphy single. None out. Remember also, Wheeler is who the Giants traded to the Mets to get Carlos Beltran. 3-0 Mets after 2/3 of an inning. I'm no satin worshipper, glad to see Ike Davis in the lineup today. Hahahahhaaha why is Cain out? Just run out of the inning? Cain must've suffered a boo-boo. Is he a candidate for a PRP injection? Schadenfreude is my favorite of all the freudes! Just saw this headline, went to post it as a comment, and saw that you all are of course ahead of the game. Dang, Fat Sandwich broke up Wheeler's no-hitter. Cain only lasted 0.2 IP. What the heck is up? Did someone say fat sandwich? LOLing at Braves fan reaction to my Freeman tweet. Have these bag of assholes lost yet? 7-0 Mutts in the seventh! Gnomes making friends wherever he goes.